Can I change the standard cost per item in this vending machine? This machine is pre-set with a $0.75 vending cost per column. Field conversion kits are available to change the standard cost per item in this machine, up to a maximum of $1.25. Please select these from the Accessories & Options menu before adding this product to your cart. You will receive enough conversion kits to convert all columns in the machine. Instructions are available in the Downloads section of this page. For vending amounts greater than $1.25, please contact Customer Solutions for a quote prior to placing your order. Field conversion kits will be shipped separately from the machine. Additional lead times may apply to these kits. 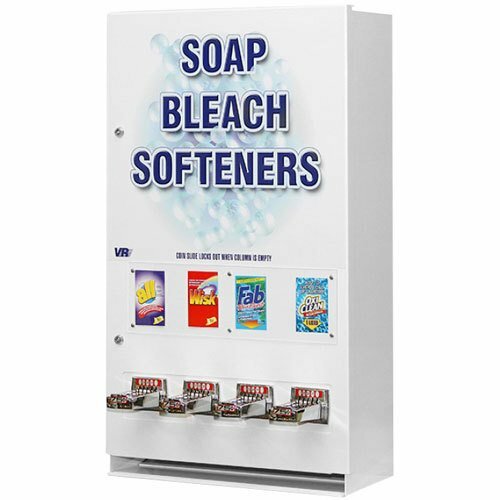 Easily stock and vend soap, bleach, or fabric softeners at your Laundromat, hotel, or apartment complex four column laundry soap vending machine! This coin-operated vending machine features an adjustable Greenwald payment system to better meet your business's needs. Each column can hold a different laundry item for greater variety, or you can double up on your most popular selections for the best profits. This machine comes with four coin slides pre-set to $0.75. A conversion kit (sold separately) allows the cost per item to be changed to $0.25, $0.50, $1.00, or $1.25. This Laundromat vending machine includes a durable exterior with a large plexi-glass display section that clearly shows each column's contents. High-security locks ensure the door stays closed at all times to prevent tampering and theft, while the internal cash box is also locked for added profit protection. Package weights seal off the vend cycle of a column when it is empty to prevent user abuse, and for maximum storage potential, each column holds up to 23 stacked packages. The Four Column Laundry Soap Vending Machine is great. It is well made and doesn't jam. It is well worth the price for years of use. This is a very high quality unit. The steel is very heavy and the locks are great. I restock everyday and have no problems with this product. I purchased this product for a hotel and have had no complaints from the guest. This product is very durable and i Highly recommend it. The Four Column Laundry Soap Vending Machine. it realy does pay for it's self our traylor park laundry mat has one. You'd be suprised at how many customers forget to bring diffrent items for their laundry. This would be nice in a motel or hotel. A little pricey but it will definitely pay for itself when people have to do a load of laundry.